Do you want to win a World Series of Poker* prize package? For a one time entry of $200 + $15 you’ll be able to get all action and play all eight events of the league. All you have to do is play the best you can, finish as high as you can, gain points for every tournament played, and win prizes based on your final position in the league. The tournaments will run twice a week during April and May 2011 on Tuesdays and Saturdays at 21:00 GMT+1. Players will gain points for every league tournament they play, and will be ranked based on the amount of accumulated points they gain from each of the tournaments. The best 6 out of 8 tournaments will count towards the leaderboard points. The last event on the league will be the WSOP Warrior League Grand Final. It’ll be open for the top 50% of players who have reached the most points up to event #8. In this Grand Final event, players will be awarded with double the usual points. The final prizes will be given on the basis of the total points accumulated in the regular events and grand event. It's time to prove your skills in the battle to become the WSOP Warrior! * Register for the league starting the 1st of April! Players will be able to enter the league either by directly registering through the lobby, or by qualifying through the satellite promotion. 1. WSOP Warrior Registration A $200 + $15 Freezeout. Registration will be available at the above cost from April 1st 2011, until April 26th at 19:00. Players who’ll register for the above tournament will be automatically registered to events 1 – 8. 2. WSOP Warrior Registration B $180 + $13 Freezeout. Registration will be available at the above cost from April 26th 2011 at 21:00, until April 29th at 19:00. Players who’ll register for the above tournament will be automatically registered to events 2 – 8. 3. WSOP Warrior Registration C $160 + $11 Freezeout. Registration will be available at the above cost from April 29th 2011 at 21:00, until May 3rd at 19:00. Players who’ll register for the above tournament will be automatically registered to events 3 – 8. Players entering the league will be registered to all eight tournaments. Players will receive points based on their performance in each of the Warrior League tournaments as per the below accumulation structure. The Warrior League Grand Final tournament will award double the points to all participating players, as described below. $100,000 in WSOP* packages is up for grabs for our top 10 warriors, including a $20,000 package for the first place finisher and a variety of entries to Side Events in Las Vegas, as well as online Super Satellite tournament entries to top league players. The prizes above include hotel accommodations and registration fees. Players must make their own travel arrangements. 1. 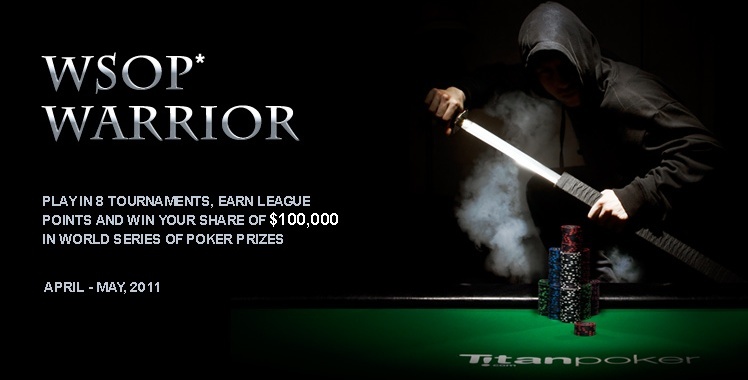 Only registered players to “WSOP* Warrior” events are eligible to participate in the promotion. Registration can be done by either direct registration, by token, or by qualifying through the WSOP* Warrior satellite promotion. The qualifying tournaments are all those with the words “WSOP* Warrior” in the tournament name. 2. Winners of the WSOP* Warrior must be at least 21 years of age in order to play in the WSOP* events, which will be held in the Harrah’s Casino, Las Vegas (Nevada, U.S.A). Winners will need to provide a photo ID to confirm they meet this condition. Failing to do so will cause an allocation of the entire prize (including spending money) to the next player in the leaderboard. 3. Registration to the WSOP* Warrior promotion will be possible from April 1st at 01:00:00 GMT+1 until May 3rd at 19:00:00 GMT+1. After this time, registration will no longer be available. 4. Prizes will be awarded to the top ranking players in the leaderboards based on the payout structure. 5. In case of an interrupted tournament/s, the tournament will replay on the following day, with all the players that were still left in the tournament at the time of interruption. The tournament will start exactly where it was stopped: this means that the tournament will start at the same level it was at when the interruption occurred, and players will begin with the same size of chip stack they had at the time of interruption. The results of the replayed tournament will then be used to rank players with points, as per the regular points’ accumulation table. 6. In case there is a tie between players’ final leaderboard points (once the promotion has ended and final results are achieved), each of the players with that number of points will receive a prize which correlates to their final place, based on the time on which they have reached that amount of points – the player who accumulated that amount of points earlier, will be ranked in the higher place, and so on. 7. The final leaderboard freeroll will take place on May 31st 2011, at 21:00 GMT+1. 8. The WSOP* Warrior tournaments will not count towards the MTT Leaderboard promotion which will be held during May 2011. 9. Players cannot qualify twice to the WSOP* Warrior. Once a player has qualified, he’ll be automatically registered to the WSOP Warrior League tournament. Upon finalization of the registration period, all registered players will be registered to the WSOP Warrior League events #1 to #8. 10. Players can qualify more than once to the WSOP* 2011 through the various WSOP* 2011 promotions. This means that players can try and win any combination of a side event and main event package, by qualifying through the WSOP Warrior League and through the regular WSOP ongoing promotions. In the case where a player has qualified more than once for the same package, using the same account, they will receive the total value of the second package in cash to their poker account. 11. Prizes will not exceed their total value as described above, and will not be transferable, refundable or converted to cash under any circumstances. 12. All WSOP* Main Event package winners will start on day 1D – July 10th 2011. 13. All hotel packages are non-refundable and cannot be converted to cash. 14. The WSOP* packages included in this promotion will be under the same terms and conditions as they are offered on Titan Poker's WSOP* satellite promotions (“As is”). iPoker will not make any changes to these packages. 15. All winning players’ personal information must be provided by the player’s card room, no later than May 31st, 2011. (Personal info: full name, full home address, phone numbers and email, DOB, and passport numbers). 16. Titan Poker reserves the right to refuse payment to any player which is found colluding. 17. Payments will be made up to 10 days from the leaderboard completion. 18. Titan Poker may amend/cancel the promotion at its sole discretion at any given time. 19. All decisions made by Titan Poker are final. * World Series of Poker and WSOP are trademarks of Caesars Interactive Entertainment, Inc. or its affiliates (collectively Caesars). CIE does not sponsor or endorse, and is not associated or affiliated with Titan Poker or its products, services, promotions or tournaments. Any promotion or tournament on this site will not guarantee your seat or ability to register for any WSOP event or any WSOP affiliated event which is at the sole discretion of Caesars.